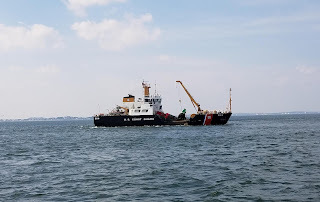 We are under way in Massachusetts Bay from Cape Ann to Boston Harbor. This morning found us in a lovely anchorage in Sandy Bay, just off the town of Rockport, Massachusetts (map). In this weather, it was a perfect anchorage. 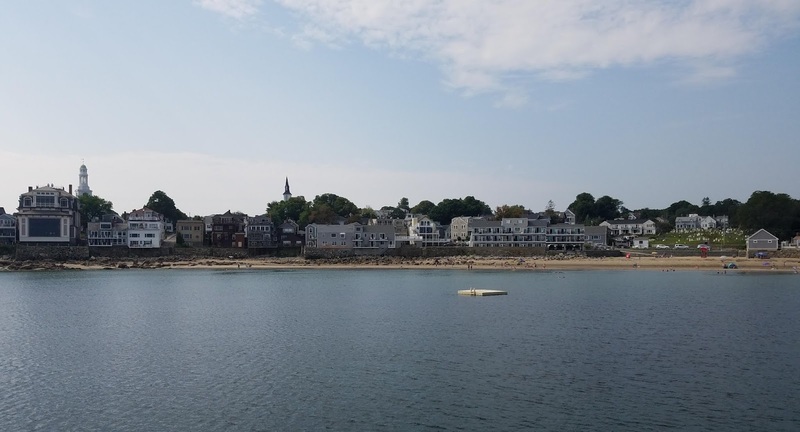 Shortly after I posted yesterday we steamed into Sandy Bay, which is really just a bight in the Cape Ann peninsula, with some protection from the remains of a breakwater offshore. Most of the bay is a rocky bottom, so we maneuvered in as close as we could to the back harbor, where we hoped for a little sand. That put us just 200' from a swim float off the town beach. Even though the water here is barely 70°, the beach and the float were well-used, even on a Monday. The view from on deck this morning. Float is closer than it looks. Having the hook down by 3:30 gave me a couple of hours to work on the new dink. I spent some time crawling under the stern, measuring for modifications to the chocks, before sorting out how to stow the life jackets, anchor and rode, safety gear, and other necessities in the new boat. I'm still working out the details but I got enough gear aboard to make us legal. We're still in the carefully controlled first two hours of break-in on the new engine, so we had to resist the temptation to open her up and see what she'll do. But we're past the "trolling speed only" part of the regimen, so I could at least get it on plane and then pull back to minimum planing throttle. We're pleased the new boat will plane with both of us on the bench seat, and, once up, it did not take much throttle to keep it there. Commercial basin at low tide. This is the lobster fleet. 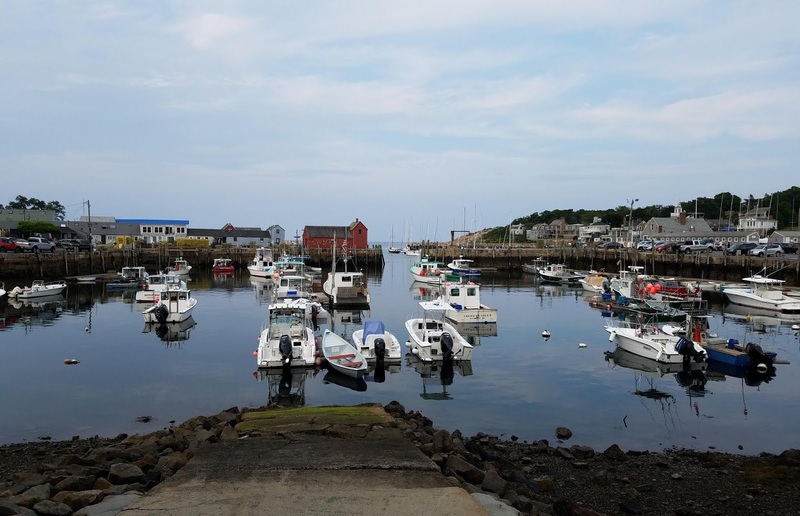 Rockport is aptly named, with a rocky harbor that is shallow at low tide. It was dead low when we left for dinner so we swung wide around Bearskin Neck and stuck to the channel. We landed at the town wharf and then walked the town, which, like much of Cape Ann, is a tourist destination for the metropolitan Boston area. 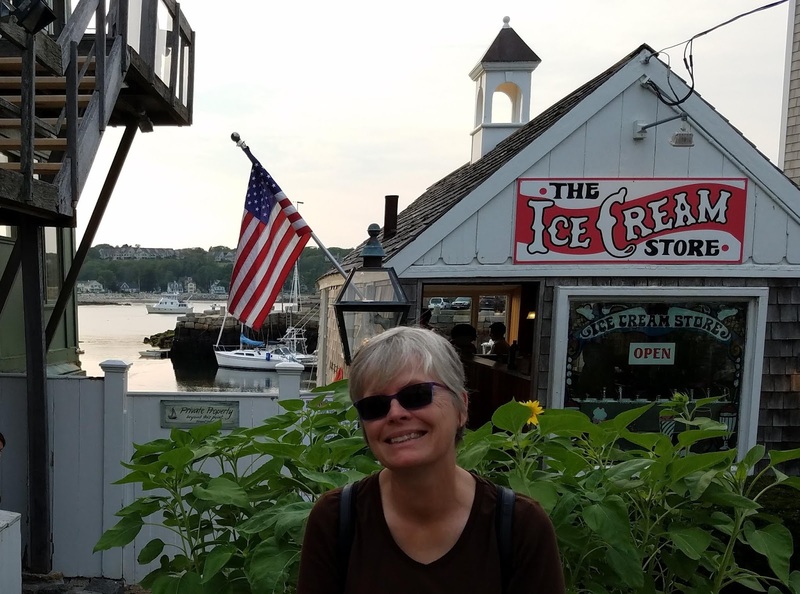 The main street and all of Bearskin Neck are lined with shops, restaurants, and ice cream parlors. The paucity of bars speaks to the fact that it is more a day stop than an overnight destination. After taking in the entire town, we ended up at Ellen's Harborside, right back at the town wharf, for a casual dinner. I had the lobster roll, in revenge for having to dodge pot floats all day. When we arrived back at Vector, live music at the band gazebo in the park was just wrapping up, and people were still swimming at the beach and float. Vector is visible in the background over Louise's shoulder in this shot from the foot of Bearskin Neck. I turned on our fancy new LED spreader lights and spent an hour or so re-working the dinghy chocks so we could load the tender in the morning without committing unnatural acts. I had to fabricate a 1" spacer for the starboard side to move the whole stern to port; the new dink, while 10" shorter than the old one, is considerably wider. The "old" dink, in turn, was wider than the one that came with the boat, and for which the permanently welded-on chocks were originally made. We had a quiet and pleasant night, and this morning we hoisted the tender aboard. I still have some adjustments to make on the chocks, but the work I did last night let us more or less drop it right into place. We exited the bay due east, and then turned south inboard of the twin lights on Thatcher Island. 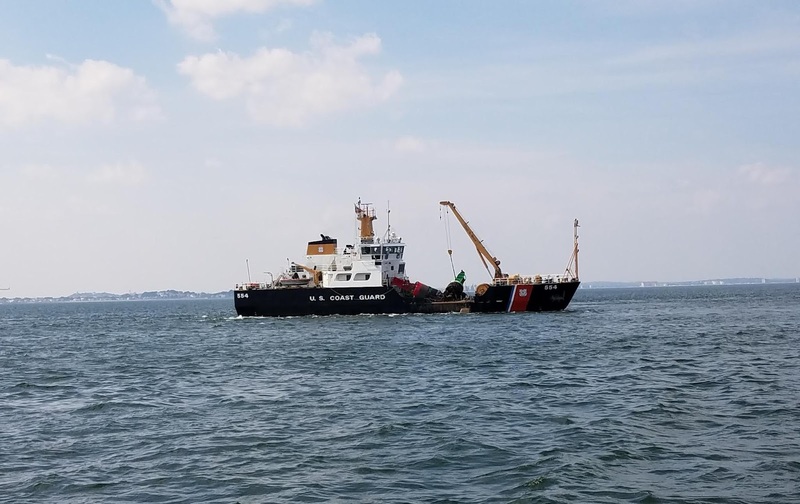 We passed the Coast Guard Cutter Marcus Hanna, a buoy tender, servicing #3 on the North Channel. It's been a hazy day, not good for photos, but we captured and posted most of this route when we came through here three years ago. As I wrap up the post, we are just entering the North Channel to Boston Harbor, and we should have the hook down in just over an hour or so. We'll be here at least a week, and maybe closer to two.